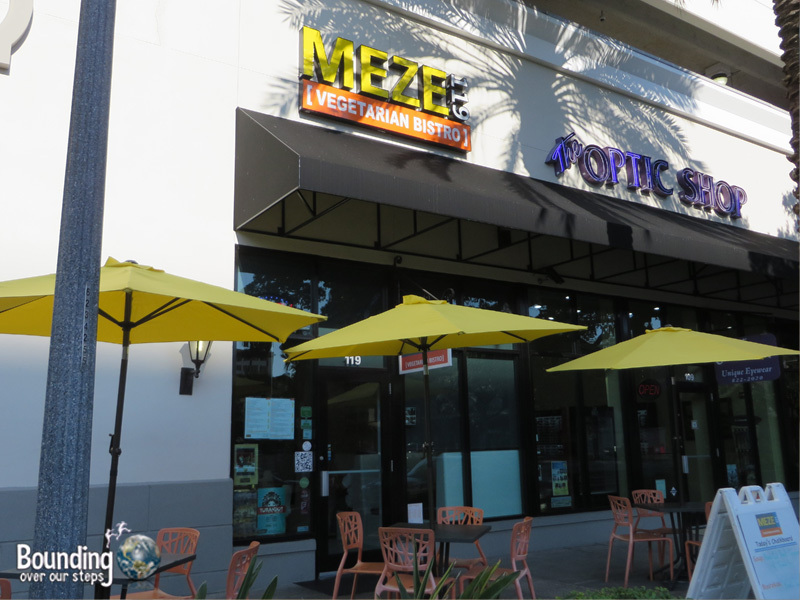 Located at 119 2nd Street in St. Petersburg, Florida, Meze 119 serves up authentic Middle Eastern cuisine with a modern twist. This vegetarian and vegan-friendly restaurant first appealed to us because of its proximity to the Devil Ray’s baseball stadium but by the time we concluded our dining experience, we already knew we would easily make the drive to St. Petersburg for a meal at Meze 119 even without a game. The dining area is quite small but the high ceilings make the space feel bigger. In addition to an outside seating area in front of the restaurant, Meze 119 customers can also choose to enjoy their meal inside at one of the tables and chairs or a very comfy booth decked out with plush pillows. A simple yet elegant mural spans an entire wall. We gladly slipped into a booth along the opposite side. Meze 119 is a family-owned business. 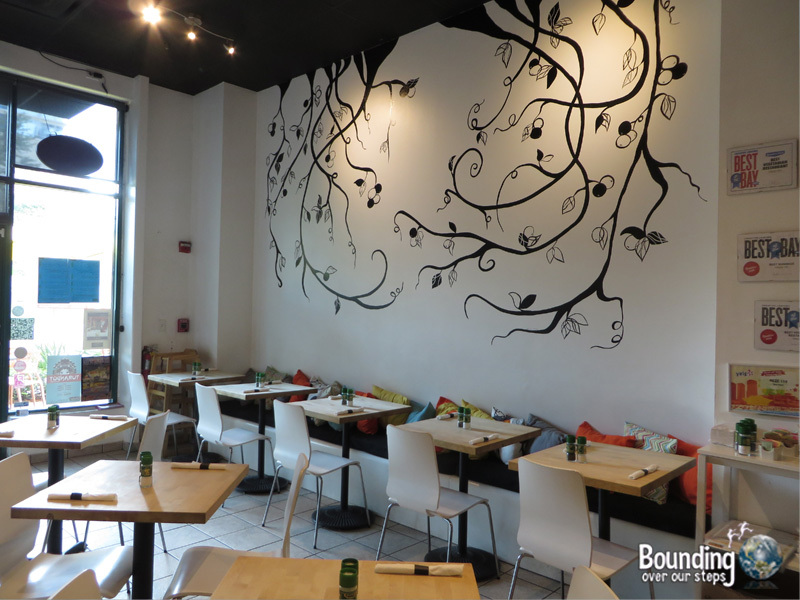 The parents of the operation are both vegan and their children both work at the restaurant in various capacities. They were inspired by the large amount of inherently-vegan dishes that Middle Eastern cuisine offers and thus thought it made perfect sense to open such a restaurant. Meze 119 is also sensitive to the kosher way of living and of course a vegan diet naturally lends itself to no cross-contamination anyway. Future plans may include expanding to other locations so be sure to keep an ear out for where that might be. If you’re lucky, they will open up a Meze 119 near you. Meze 119 has a Sunday brunch menu, a lunch menu, a dinner menu and be sure to save room for something off their dessert menu. They also serve a variety of drinks, including a good selection of beer and wine. Many of the dishes offered are the same for lunch and dinner but there are decidedly more sandwich options for lunch. The dinner menu includes appetizers, soups, salads, sandwiches and six vegan main dishes, including blackened tofu steak, pasta Alfredo and acorn squash. There is an impressive section dedicated to hummus offering appetizing variations including classic, spicy, with tahini. 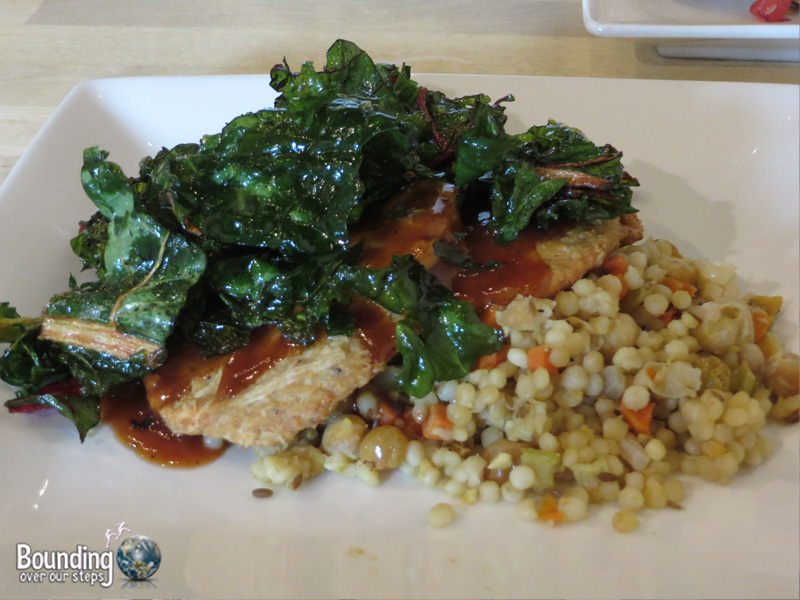 Mindy tried the very flavorful Moroccan BBQ chikk’n, which is coated in a spiced BBQ sauce, served over cumin scented couscous with crispy greens and according to Dean, part-owner and manager, is the most popular vegan dish at Meze 119. 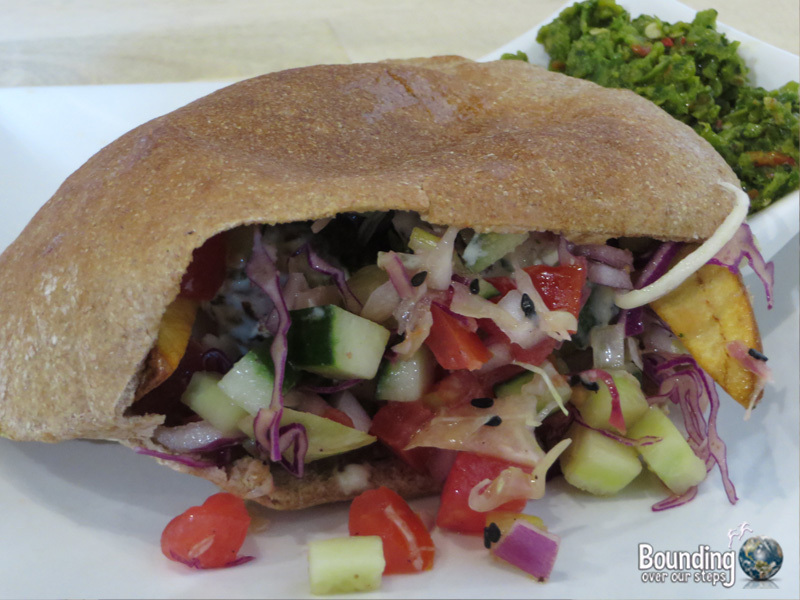 I ordered the falafel sandwich with schug, a green spicy sauce that I highly recommend adding to your meal. My falafel sandwich was stuffed tomatoes, red cabbage, cucumber, onions and french fries, rather reminiscent of those I’ve had in Israel. Falafel sandwich with all the fixings! It was very easy to be vegans at Meze 119. All vegan dishes were clearly marked with a (v) on the menu and the wait staff seemed to know the menu well and understand the difference between vegetarian and vegan. In addition, there are so many vegan options to choose from that we never got the feeling we were missing out on anything. 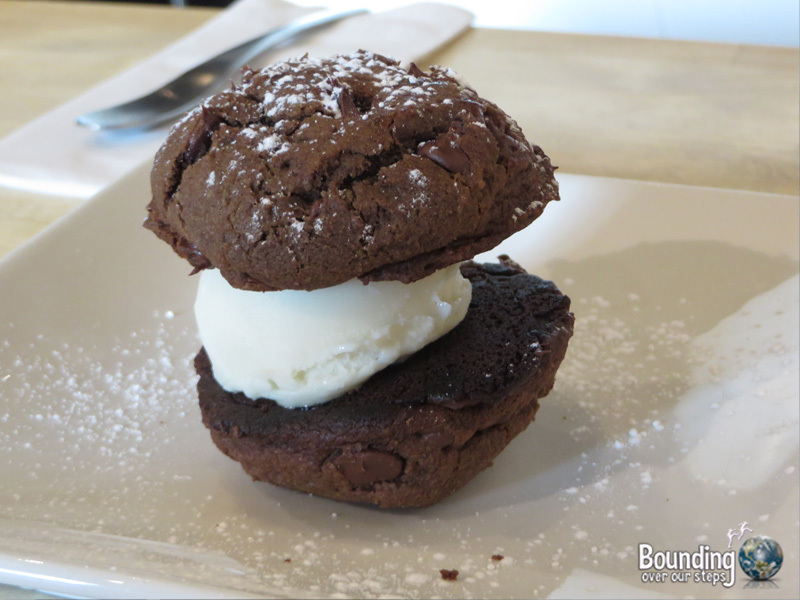 For dessert we tried their ice-cream sandwich, a gourmet version of a classic treat, and the only vegan option on their menu. We enjoyed every decadent bite! Two pieces of milk chocolate automatically come with the bill so if you are looking for a 100% vegan meal be sure to alert your server not to include these. The service was friendly and relaxed and our waiter seemed knowledgeable about the menu. The food was brought to us promptly and despite the fact that the waiter did not write down our order, everything was correct! With dinner dishes ranging from $5 to $16 we found the prices at Meze 119 to be very reasonable, especially when considering the quality of the ingredients and the care that goes into making each dish. As soon as we left the bistro we already knew that we would be back. I’m looking forward to trying the acorn squash and the stuffed pepper and Mindy is eager to taste the kefta.